To start with I have to correct myself on the new routes. 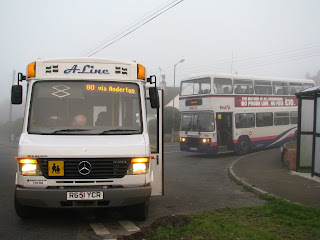 The 80 is how I said though 80A is a Cawsand to St Germans service and 80B is a St Germans to Trago Service. I have done this with a driver now and the route is very well timetabled and is very convienient for the users meaning they can go and do shopping in multiple destinations. The school contracts were also slightly wrong. Because of timings the Torpoint Narkus is actually Antony-Narkus with FDC providing the link between Torpoint and Antony. And there is actually a Cremyll, Cawsand, Witsand bay school service and is not seperate as stated before. This has also meant that sadly M152 LPL has not been brought out of retirement. 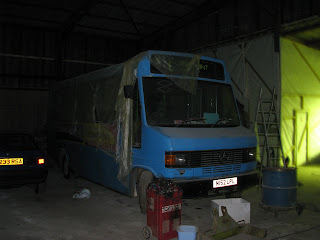 The picture shows her current state in A-Line's depot and she will sadly very likely not be used in service again. School buses are operated by either of the 2 coaches and the Narkus is operated by X891 YGU, leaving R651 YCR to operate the services. E920 EAY has now had branding put onto her in the smart new A-Line livery as seen on the Varios. I will hopefully get a picture of this soon. And lastly welcome to new driver Steve who now drives many of the afternoon 80s and is soon to start the 80As and Bs aswell, so good luck to him. More news to come when it happens.